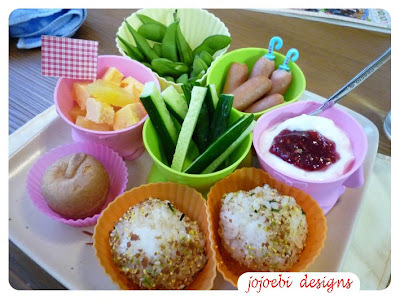 jojoebi designs: Muffin Tin Dinner and new picks in the shop! Muffin Tin Dinner and new picks in the shop! Clockwise from the pink check flag, cheese and pineapple, eda mame, sausages, yoghurt and raspberry jam, rice ball with sprinkles x2, little apple cake and cucumber sticks in the middle. Remember the new so cute you want to squeal picks that I told you about in this post? WELL.... I raided the shop and bought all the packs that they had (probably making the checkout girl think that I was some kind of crazy bento fiend) and I have put them in the shop, I only have a few left, so get over there quick sharp! What a great meal!I love all the foods you chose. That apple cake is sooo cute! Tell me more about where it came from? thanks! Alison, the little apples pies... in Japan each town/area has something that it is famous for and when you take a trip it is the custom to pick up some small food gift to give to friends/co-workers when you return. We actually bought these apple pies when we went on our golden week trip to Kitakami, we didn't manage to buy anything in Kitakami so we picked these up somewhere on the way back, the region is popular for apples! So, we had planned to give these to a friend but then the we had to cancel the date we had with her and then realised that the next chance we were going to see her they would have gone out of date, which is why we ended up eating them! They were good!! Super yummy tin! The apple pies are adorable! what a beautiful tin! colorful - very summery! We've never made rice balls, but I have been wanting to. I love the apple pie tradition. Looks like a great meal. You always have the prettiest meals. Very nice! I wanted to pick your brain on something- we’ve moved from London to Qatar just last August, hubby (secondary maths) and I (primary) are both British teachers you can see my modest blog for an idea. We have Eid coming up at the end of September, and I’m just racking my brain for some ideas to celebrate with the children. I wanted a large centre piece to go in the sitting room, like a Xmas tree. So I was brainstorming: a date palm tree (sewn and stuffed) a camel with a saddle and bag to put the presents in, or a large colourful bag with appliqué pictures of a mosque, camel, palm tree- if you have any ideas I would love to know. Also I wanted to make something similar to a stocking to hang on the wall, again relating it to Islam, Arabia. I know it seems far away now to plan for this, but I’m starting work in September and were off back to Britannia (which I have missed sooooo much) in July for 6 weeks. Sorry about the long e-mail, it’s just that I kept thinking ‘what would Jo do?’ ‘What ideas would she have?’ So I thought it was worth a try to ask you. Moona, I am going to have to think about this one! I'm brand new to your site and I must have been inspired because I saw this yesterday and today made a muffin tin lunch for my 4 year old daughter with green beans, carrot sticks, olives, cheese, sliced hard boiled egg and tortilla chips. She ate everything which almost never happens! THANK YOU!!! !